Offering you a complete choice of products which include cast padding, orthopaedic cast padding and soft roll. We are leading manufacturers of fabric and finish product for Cast Padding / soft roll . 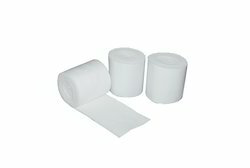 Our soft rolls have very high absorbency and our material is appreciated everywhere because of our quality. We are a sole proprietor firm, presently satisfying our clients by manufacturing and exporting a foremost assortment of Ortho Roll Cast Padding. Made using quality fabrics at our modern machining facility, these padding are extensively used for the protection of bones from elevation and projection. Our Ortho Roll Cast Padding is also act as a cushion between bones and POP during the bone breakage to ensure fast recovery and to minimize skin irritation.